The entrance to Consolidated Ward's theater 8, the Titan XC. This post is going to consist of two parts. The first part will be a relatively quick “first thoughts, reaction, and feeling” of the new Titan XC theater at Consolidated Ward for those who just want a quick read. Following that, the second portion of this post will go into greater detail of my experience in the newly renovated theater. If you want a good movie experience, then Consolidated Ward’s new Titan XC will have one to offer. However, moviegoers should be informed about the moviegoing experience that they can expect to have. First up, so we can get it out the way really quick, this IS NOT an Imax theater. The image quality on screen simply cannot match that of the Imax format. Is the image quality bad? Hardly, this is a relatively brand new projector (installed in about April) and it does a nice job of showing bright and crisp images–it just doesn’t show the high “HD like” quality that Imax does. Second, the sound. Consolidated amped up the volume by installing a bunch of new speakers, most noticeably on the sides and ceiling of the theater. This did make for a much louder experience, but it was hard to gauge the effectiveness with a movie like Toy Story 3. Was the sound louder? Yes. Was it loud enough to drown out the crying child in the row behind me and three seats over? No. Third, the screen–while it is wall to wall and does make for a more dramatic presentation, I personally didn’t think it added that much to the viewing experience. Fourth, the seats–while they are nice and new, I overheard an employee mention that they are pleather seats. Still they are comfortable just the same as the old ones. Although, one plus is that all of these seats recline a little (like the ones in the first few rows). Also all rows and seats are now numbered so you can properly find your reserved seat. Fifth and finally, the glasses. These are the bulkiest of the 3D glasses I have ever worn and if you wear regular glasses, I hope you have a small pair as I fear larger frames may not fit under the XpanD 3D glasses. Also, for some reason, the on screen images are darkened when wearing the glasses so expect a slightly muted presentation for 3D showings. Overall, I think you’ll get a decent experience with Consolidated’s new Titan XC. I just don’t think it will be as “world class” as is being advertised. I still say that the biggest selling point of this new theater will be the reserved seating. Want to see Eclipse on opening night AND be able to show up just 20 minutes before the movie starts? This will be the way to do it! Consolidated Ward’s Titan XC in theater 8 definitely had the “new theater smell” like when you get a new car. Here’s more of what you can expect from each of some of the new theater’s features and an introduction from theater management. The new seats showing the row and numbering system. As mentioned previously, all the seats are brand spanking new (hence the new theater smell). As far as comfort levels go, I really couldn’t tell the different between the old seats and the new ones. What I do like though is all of the seats recline a little (about 3-4 inches backward). As noted in the images above, all seats are are now numbered. The numbering starts at #1 on the left side of a row (if you’re facing the row) and works it’s way up as you move to the right across the row. Rows are numbered by letters. I know that the upper portion of rows in theater 8 are double lettered (AA, BB, CC, etc) and increase as they work they’re way up. I forgot to check while we were there, but I’m not sure if the rows in the lower level are double lettered or single lettered. Though I suspect they are single lettered to differentiate themselves from the top portion of seats. The row numbers are illuminated so you will have an easier time finding your row in the theater if the lights are off. I only hope they have new cleaning supplies as well because once food or drinks start falling on seats, it will definitely be more noticeable than with the old ones. You can make out the slight curvature of the screen from this vantage point. One aspect of the Titan XC experience that delivers as advertised is the wall-to-wall screen that now fills the entire 66 feet width of the theater. At first glance it doesn’t seem too big of a difference. 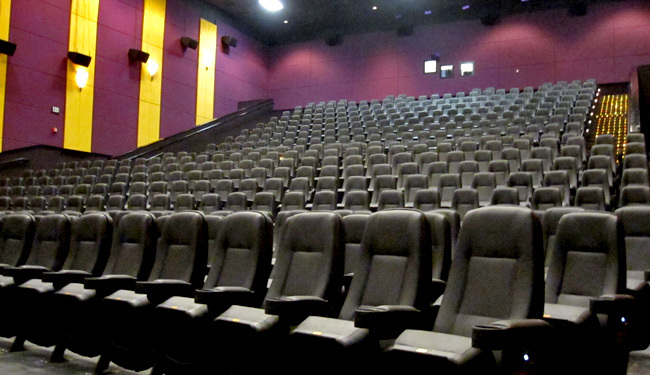 After all, Ward’s big theaters (#7-10) already had bigger screens when compared to Dole, so what do a few more feet add? Well, you know the saying, “bigger is better,” it still applies. Those few feet do make a difference and make the theater that much more new and different. One noticeable improvement though is that now the screen is concave or curved away from the audience. This is done to negate the effects of distortion from the projector. One thing to remember though is that with bigger screens you need to sit farther back to enjoy the experience. I would recommend sitting in the upper portion of the theater if possible for the optimal experience. Huge JBL speakers line the walls of the theater giving it 7.1 audio channels. One of the first things you notice when you walk into the Titan theater is that there are a lot more speakers than there were before. JBL speakers line both sides of the theater and the ceiling. I’m sure there were speakers on the wall before the renovation, but they have been since upgraded to the more noticeable JBL ones now installed (9 on each wall, 14 on the ceiling). Also part of the upgrade included doubling the subwoofer power behind the screen. All this leads to an extra 2 channels of audio in the theater. Theater standard is 5.1 surround. Consolidated went above and beyond to upgrade the theater to 7.1. Now does this translate to a better movie experience? The jury is still out on the audio with Titan. The sound was noticeably louder in the Titan theater, but I’m not sure if I was really that much more immersed in the seven channels of audio. Probably a better measuring stick would be a movie like Saving Private Ryan or some other action movie. As it stands right now, Titan’s roar is louder, but not necessarily more intense. As I opened up with in the quick review section of this post, picture quality in the Titan theater is marginally better than other theaters. The image is clean, clear, and crisp, but it’s no Imax. As mentioned in their press release, the theater is operating an NEC digital projector. A quick web search of NEC’s offerings for digital projectors show industry standard projectors, a standard that is below that of Imax. However, Titan is a digital theater so it does have a leg up on other film theaters. If you have an option of seeing a movie in a digital theater or a film theater, opt for the digital one. With digital projection, the film print does not degrade from multiple viewings (this results in faded images and lots of artifacts, or spots, seen when viewing). Since Titan is indeed digital, the picture will look as good from the first viewing to the 100th. A positive note about this NEC technology is that their website states that later this year, their models will be able to upgrade to higher resolutions–hopefully Consolidated can implement this. This is probably one aspect of the Titan XC experience that affected me the most–their 3D glasses. I’ve used 3D glasses for Imax, Dolby 3D, RealD, and now XpanD. Out of all of them, the XpanD’s have been the bulkiest. Now I usually don’t mind the glasses. This time though, I had to wear my glasses underneath the 3D glasses and while it wasn’t irritating, I definitely “felt” the weight of the glasses on my head over my own glasses. Another moviegoer in my party mentioned that they didn’t like the XpanD glasses and that the Imax one’s are better since they are lighter and easier to fit over your glasses. Another somewhat negative aspect of the glasses were that they really darkened the picture image on screen. Without them on, the picture was bright and the colors vibrant. When put on, there was a significant change in picture brightness. Don’t know exactly what the story is with that, but it’s another reason why I probably wouldn’t see another 3D film in this theater. I still believe that the biggest selling point of this theater will be the fact that you can reserve your seat. For an extra $3.50 (regular Ward ticket prices start at $10.75 for adults) you can see a movie on opening weekend without having to worry about coming early, standing in lines, and then fight the crowd to get a good seat. And I like how there are two prices for films in the theater, one for 2D and another for 3D (Dole’s Imax has a single price for both 2D and 3D movies). In the end, Consolidated was smart my making their Titan XC price points lower than those of Dole’s Imax. As I theorized in my previous blog post, a lot of the “experience” of the Titan XC theater at Ward can be chalked up to marketing by Consolidated. It’s not a bad experience, in fact it’s a pretty decent one–it’s just not as great as an experience as advertised. However, this shouldn’t stop people from going to check out the Titan XC experience for themselves. We’re all different so you might come up with your own assessment of the theater. As with all things, be informed about your movie viewing choices. That sums it up. Consolidated’s recent attempt to counter or best Regal’s IMAX is woefully short of successful. Consolidated chose to go with XpanD for its 3D presentations. This is a horribly terrible choice. First, the picture is SO dark, you can’t really even keep up with the story unless everything happens in sunny daylight. This is due to this system’s single projector. The picture is so dark, it renders 3D films literally walk-out bad. 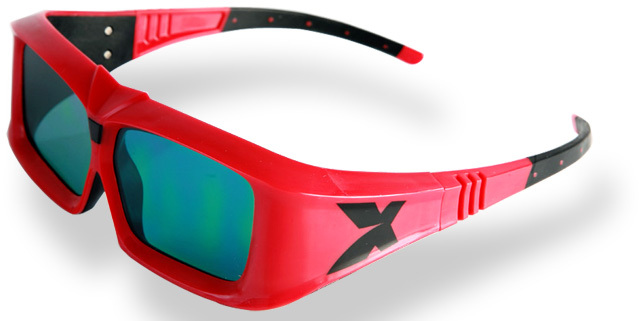 Then there are the XpanD 3D glasses. These are “active shutter” glasses, which means that each eye is alternately blacked out very quickly so that each eye sees what it is supposed to see to replicate 3D while the other eye is blind. Maybe someday shutter glasses and their partnered projectors will operate at a substantially higher shutter rate, but at present, there is a noticeable flicker that is not only annoying but gives me a headache and a bit of nausea. And these glasses are VERY bulky, front heavy and have an inescapable reflection from the light bouncing off of your cheeks. XpanD is easily the worst 3D system I’ve experienced and that includes IMAX and RealD. Compared to IMAX, the XpanD system serves as little more than something IMAX can reference in literature, conferences, etc. XpanD is the perfect example of everything NOT to do in 3D. IMAX has their own proprietary DMR (Digital Media Remastering) technology that cannot be seen anywhere other than at an IMAX theater. This proprietary technology renders images at IMAX screen size virtually free of grain. It is literally life-like. Then there are the twin projectors that IMAX employs. 2 projectors equals very bright. IMAX is EASILY the brightest 3D system in existence and compared to XpanD’s darkest, there is no comparison. IMAX’s 3D image will be perceived to be literally 3 or 4 times brighter than XpanD’s. Even RealD’s image is 1.5 to 2 times brighter than XpanD’s. Comparing XpanD to IMAX is like comparing a Mazda Miata to a Ferrari Enzo, night and day, respectively and literally. There is NO comparison. Well, Consolidated certainly hasn’t taken the modest route advertising it’s total number of speakers and 75,000 watts of audio power. The irony is that TITAN XC will never use anywhere near 75,000 watts unless they literally intend to deafen the entire audience and bleed their ears out. Seriously. Unless their speakers have a 64 Ohm impedance, which I can guarantee you they don’t. Indeed, there are speakers everywhere. Which is strange since they are getting audio signal that does not support 32 channels. The result is a lot of volume and honestly terrible sound. And I don’t mean this in a relative way. I’m not saying that so many speakers and watts should sound better. I’m saying that every movie theater on Earth should sound better than TITAN XC. It is truly a poor system that sounds very cheap. You don’t FEEL anything! No believable cracks of gunfire. No legitimate booms from explosions. It is a flat system that has no low end or accuracy at any point in the hearing range. Compared to IMAX, TITAN XC’s sound is laughable. If you saw Hubble 3D at IMAX, the CRACKLE and BOOM of the Space Shuttle’s booster rockets that you FEEL will make you a believer! The whole theater shook and you FELT like you were IN the Space Shuttle as it launched! Even with the gratuitous over-the-top explosions in The Expendables, TITAN XC failed to deliver a single rumble to be felt. IMAX’s sound can ACCURATELY replicate live concerts, Space Shuttle launches, train crashes, gunfire, you name it. TITAN XC’s sound, in all honesty, isn’t even as accurate as my home stereo though it is much louder. I’m only pushing 200 watts max and rarely get above 30 watts used. The sad FACT is that all the other non-IMAX theaters at Regal sound better than TITAN XC does. And that is no joke. 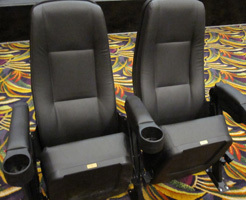 TITAN XC’s leather reclining seats are a full light year ahead of any of Regal’s seats in Hawaii. They are VERY comfortable. And they can be reserved! This is THE greatest feature of TITAN XC in my opinion. It’s sad that with such an explosive, glittery and bragging logo that the greatest attribute to TITAN XC is that you can reserve seats. And fine seats at that. Alas, that is the case. For 2D new releases that aren’t particularly important to me, TITAN XC may get my vote for the simple fact I know I’ll have a great seat in a great part of the theater without hassling with a line. For ALL 3D films and 2D blockbusters like Iron Man 2 or any film that is particularly cinematically beautiful or musical or where sound is important, IMAX’s VASTLY superior video and audio is truly the only way to go. Can you imagine seeing the last episode, presented in 3D, of Harry Potter so dark that you don’t catch everything??? NO WAY! I grew up in Hawaii and Consolidated’s been my theater since I was a child. I felt a loyalty to them when other theaters entered the Hawaii market but was turned off to Consolidated by baffling decisions on their part. What got me to leave Consolidated behind was when they started showing “pre-show entertainment.” Everyone else knows this as “commercials.” A) I paid for a ticket and don’t want to see commercials. B) How stupid does Consolidated think its customers are to fall for a retarded euphemism like “pre-show entertainment” and not get pissed off that they paid to watch commercials? And they swallowed this “advertising everywhere” hook big-time. Now there is advertising on the floor, walls… Pretty disgusting. Then there was this move with TITAN XC… I’d love to know who put this surely insanely expensive dog together. Geez, the glaring flaws at Consolidated… Hire me, would you? You NEED someone else at the executive level and that’s for SURE!